Food is an important ingredient of human life – lifestyle, survival, tradition, culture, comforts, relationships and festivals – food plays a vital role in everything. Europe is a continent that’s known for having the best of everything, be it fashion, lifestyle, history, food or anything you can think of. So, here’s a list of top 8 European foods worth sampling whilst travelling. This yummy Turkish recipe is a well-known European food. It’s made of lamb meat attached to a machine vertical skewer. Doner kebab is a popular street food which originated from different tribal regions in Turkey. Studies show that this special food was introduced in the 18th century. Today, with a juicy taste and silky smooth texture, this dish has become one of the top foods in Europe. Every traveller who is bound for Europe will surely appreciate the awesome taste of Portuguese Chicken. Since time immemorial, this recipe has been part of the elite’s regular meal. Flame grilled Portuguese chicken with its succulent appearance is cooked to perfection so as to deliver the juiciest flavour. In other parts of the continent, tourists prefer eating Portuguese chicken burger. Chicken breasts are converted into burger patties and topped with lots of tomatoes, onion rings, lettuce, cheese, herbs and mayo. Britian has its fair share of the best European foods. Its chips and fish has been a favourite delicacy of many English people for years. A large fish fillet with chips certainly makes this dish appealing for any traveller. It is the most loved European food and UK’s traditional fast food which was introduced in 1850. This food is made of special Panini bread with luscious pieces of boneless chicken, a few seasoning and lettuce. Before adding the ingredients to the Panini bread, they’re tossed first, giving out a unique taste that’s entirely European. 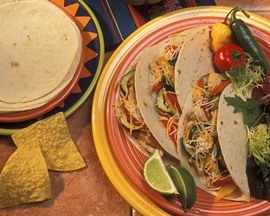 Spanish tortillas are often confused with Mexican tortillas but they’re totally different. Spanish tortillas are made with potatoes, egg and olive oil. It’s also commonly referred to as Spanish omelette. Travellers could opt for different variations depending on their own preferences and tastes. The tour of Europe will never be complete without eating the best French bread. France is popular for providing the ultimate dining experience and fine restaurants, but what makes the experience exhilarating is its French bread. This special bread comes in different sizes and shapes with assorted flavours. Germany is a pioneer in sausages and if you’re a traveller with a great love for sausages, then it is recommended that you fly to this European country. There are more than 1500 kinds of sausages to choose from. This traditional Romani dish consists of beef stuffed with bacon and mushroom. Muschi Poiana is usually served with tomato sauce and a puree of selected vegetables. Likewise, the stuffing is also provided in special crepes for the traveller’s enjoyment. You could also order extra cheese to top off this one-of-a-kind European dish. Before travelling, everyone is encouraged to get an EU residents travel insurance. This way, your mind will be at ease during your journey. Remember that an EU residents travel insurance is intended to provide ample coverage for flight accidents, lost luggage, trip cancellation, medical expenditures and other losses that might occur while travelling.